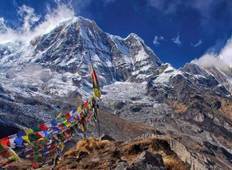 Discover a varied offer of budget mountain hikes tours that will take you through some of the most renowned destinations such as Kathmandu and Pokhara. Each affordable tour will provide you with memorable experiences for some of the lowest prices on the market. "The Annapurna Base Camp is a magical destination, but one that requires a high degree..."
"Our trek to Annapurna Base Camp was the best experience I have had. Outfitter Nepal..."
"We recently came back from Annapurna Base Camp trek and I don't have any words to..."
"The trip was well organised. The Alpine Club Of Himalaya team did an excellent job..."
"The Annapurna Base Camp Trek was recommended to us by Nepal Hiking Team when we enquired..."
"It was tougher than I remembered from 1981, when I was 29 years Old. This time I..."
"fantastic trek with responsible tour operator, I really enjoyed their hospitality..."
"Great company to work with, very flexible . We went to Annapurna base camp May 2017...."
"Everything was well organized and the plan was communicated to us well ahead of the..."
"Experiencie of a lifetime, we had an amazing time doing this trekking, we went to..."